Centrally headquartered in Nashville, TN, Premedics Systems provides complete AED services that simplify implementation and on-going maintenance of AED and Public Access Defibrillation (PAD) programs—keeping you READY to Save Lives™– like no other company in the world. Unlike most AED providers, Premedics offers a full-service remote and on-site managed approach to protecting client locations with AED technology, innovative management services and on-site readiness inspections/training, synching the on-site realities of a customer’s program to Premedics’ “Best Practices” standards. By offering AED products, training and management, Premedics Systems instills confidence that your AEDs are ready at all times. Currently, more than 1,000,000 Americans are protected by Premedics Systems. Hundreds of lives have been saved because Premedics’ trained responders used AEDs and emergency oxygen to restore the heart’s normal rhythm on victim’s experiencing sudden cardiac arrest. Premedics Systems realizes seconds save lives. Not too long ago, there was no way to quickly receive life-saving care for sudden cardiac arrest unless you were lucky enough to have a paramedic EMS unit driving nearby when you collapsed. But automated external defibrillators (AEDs) have made it possible for non-medical personnel to act, even before paramedics arrive. Today, more and more companies, campuses, and communities are strategically implementing pre-EMS, public access defibrillation (PAD), and medical emergency volunteer response programs. These programs address medical emergencies during the precious lifesaving minutes before professional emergency personnel arrive. 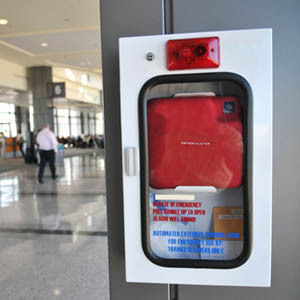 Unfortunately, many well-intentioned facilities purchase and install an AED without the professional, on-site consultation of a pre-EMS specialist — resulting in facility personnel who are not trained in sudden cardiac arrest (SCA) scenarios , and equipment that may be outdated or even fail to work in a medical emergency. Effective pre-EMS programs are consulted, implemented and maintained systematically, ensuring the AED system is ready to protect a life at any time. Premedics Inc., founded in 1998 by paramedic Brent Hetherington, has innovated a best practices service infrastructure to systematically serve customers’ pre-EMS readiness needs nationwide. Premedics created the first cloud-based AED Management system called AED Manager™, providing remote services and account specialist support. Premedics currently protects more than 1,000,000 lives every day. Premedics Systems LLC, founded by Brent Hetherington in 2008, couples Premedics Inc.’s remote service infrastructure with proprietary on-site services provided by paramedic-trained, pre-EMS field specialists who visit each customer location every year to verify pre-EMS readiness. Premedics Systems, LLC. provides both its remote AED Management and on-site, pre-EMS best practice services via Premedics Sync™. Premedics specializes in managing AED system best practices by providing AED technology, on-site inspection and training, and comprehensive management for corporations, health care providers, multi-location businesses, churches, schools and universities, malls, and other public access spaces. Whether your organization has one location or hundreds of locations, Premedics is your trusted advisor for consultation, implementation and maintenance of AED best practices, so that lives are protected. Premedics Systems has the privilege of serving the following organizations to provide employee, client, and campus-wide life safety through proper AED accessibility, training and management.